Whether a cherished family heirloom or a trendy new table, it’s no place for dust or smudges. That’s why for more than 50 years, Pledge has helped dust, clean, moisturize and protect your furniture quickly and easily. 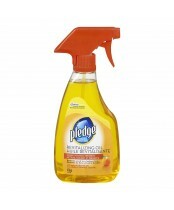 There’s a Pledge product for every surface, including wood, glass, countertops, electronics, floors, appliances and upholstery. So when that nosy neighbor starts peeking in your corners for dust ... all she’ll find is a beautiful shine. That’s the beauty of Pledge.